With 22 years as marketing director of the New Zealand Film Commission under his belt, Lindsay Shelton has many tales that could be told about the growing years of the New Zealand film industry, and many such insights are contained within this peek behind the scenes. Together with John O'Shea's memories 'Don't Let It Get You', these very insightful books will provide an understanding of what has been the film scene in New Zealand during the last half of the 20th century and in the case of Shelton's book, also the first years of the 21st century. 'The Selling of New Zealand Movies' is not about movie glamour or fame; it is about determination, learning on-the-fly and dealing with disappointments. We are introduced to people that most of us have never heard of, but have been just as important in the development of New Zealand film as the more known actors and directors. But it also contains stories and insights into what the actors and directors have had to indure as well. 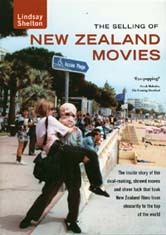 Gratefully the book includes a filmography from 1914 thru 2005 and a separate section listing the non-New Zealand titles, from 1916 to 2005, that used New Zealand as their location site . We are indeed fortunate to have Lindsay Shelton share his experiences and insights on the develpment of the modern New Zealand film industry. 037 - Which Way's Invercargill?